I like the flow chart! I’ll often write scripts, with the various characters each being one part of my mind. Then I try to capture the internal dialogue, whether it’s about lust, decision-making, or whatever. Thanks again. My mind is too chaotic to follow the flow chart accurately, but I did skim it and got the general gist. I like where you ended up from where you began. I like to be happy and content, so I tend to work backwards from that point. That is, I try to understand what people are thinking and feeling based on what I am thinking and feeling when I exhibit the behavior they do. This helps me to understand what they are going through rather than getting irate or annoyed at their behavior. If this seems to lack sense it is because of the chaos inflicting my mind and preventing me from creating beautiful flow charts. But I sent a memo to Dilbert about it, and he IM’d that he will prepare a presentation for me and present it at the next staff meeting. You have to bring the donuts. Disclaimer: This does not work in traffic! Mmmm… donuts… mmmm… I knew there was a reason why I love flow charts! I reach exactly the same conclusion in a tiny amount of time. I would love to think that the same flow chart applies, only faster (a gush chart? ), but I think I’m just a little lazy. Still. I love flowcharts of all sorts…and this one makes sense :). Sometimes we need stuff like this to get our head around things. Thanks, Val. I enjoyed your take on the discussion, too. I love this, Diane: the situation in a nutshell! Thank you! I tried to write it all in words, but I ended up with ponderous pedantic paragraphs. Try saying that five times fast. 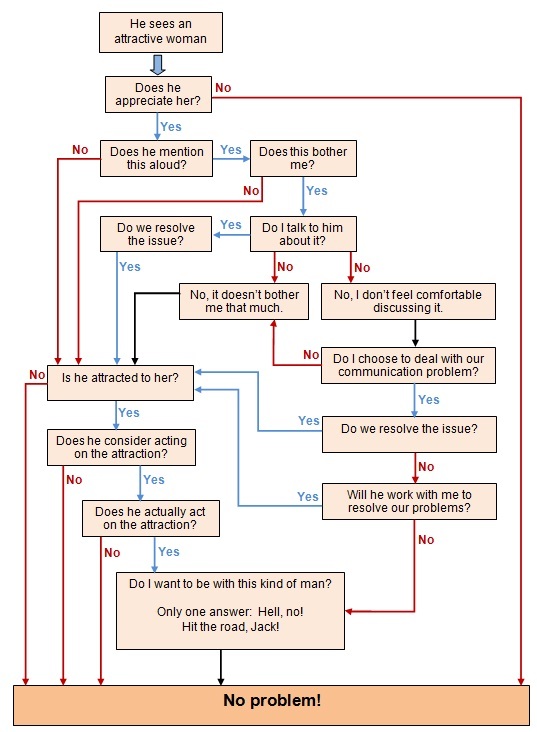 What a great flow chart! I love that you took the time to outline your feelings, and potential feelings. Very “geeky” indeed. 🙂 And thankfully, it didn’t cause distention, but thanks for the warning. To further comment upon a comment Charles left on his blog, before the link to yours, I think what we feel does change from moment to moment. In fact, I feel differently today than when I first commented on his post. And your flow chart seems to allow for many variations of the human condition! Allowing room for whatever you’re feeling at the moment. Nicely done. I like the omnipresent Yes and No too, Diane. They bring home the point that there is always another option, another perspective to look at. Thank you. Thank you, Priya! Your responses to Charles were what inspired my flow chart. It was fun to see all the ways and reasons that we agree. I admire you, Diane. My mind doesn’t have any rectangles or straight lines. I especially like that you have Yes and No emerging from each box. That reminds me of something essential that I failed to address in the post: I don’t always feel the same way. Something might not bother me today, but could very well annoy the life out of me tomorrow. That’s just another element in the complex world of relationships. But you have it figured out: You always end up at No problem. I think you should create a series of these flow charts and put them into a book. Thanks, Charles! Isn’t it funny how our minds work? I’ve done “mind maps” with creative people, and I’m fascinated to see the complex, organic structures they create. Mine always look like, well, flow charts. Great for organization, not so great for creativity.